Sudbury, Ont. 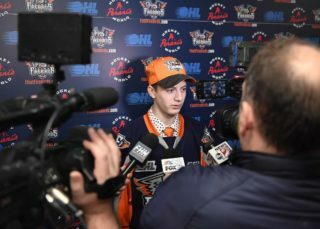 – The Firebirds dropped a 9 – 2 decision to the Wolves in Sudbury Friday night. Ethan Keppen and Jacob Winterton each scored for the Flint. Keppen (4 games) and defenseman Riley McCourt (7 games) each extended their personal point streaks. On special teams, Sudbury’s third-ranked penalty kill held the Firebirds to one goal on seven opportunities. Flint’s penalty-kill stopped three of four Sudbury power-play chances. 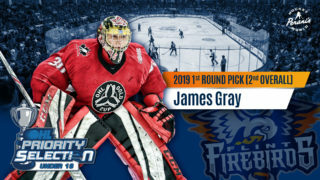 Both Flint netminders saw ice time, with Luke Cavallin making 25 saves on 32 shots before Vella entered the game and stopped seven of nine. Rookie netminder Jonathan Lemaire picked up a win in his first OHL game, stopping 24 of 26 shots. Offensively for the Wolves, Blake Murray led the way in scoring with a hat trick and an assist, and Nolan Hutcheson recorded a five-point game (2G, 3A). An early defensive turnover by the Firebirds resulted in a three-on-one opportunity for the Wolves. First-year forward Owen Robinson carried into the right-wing circle with Adam Ruzicka (Calgary Flames) streaking up the left and Shane Bulitka trailing up the middle. Robinson passed to the trailer between the circles, and Bulitka one-timed the pass back to Robinson at the bottom of the right circle. The quick tic-tac-goal found its way under Flint netminder Luke Cavallin. It was Robinson’s seventh of the season, scored at 1:13 on the game’s first shot-on-goal. Just past 11 minutes into the first period, Quinton Byfield picked the pocket of a Flint defender while the Firebirds had the man-advantage. He sprung out of the left corner and carried across the bottom of the circle. He used patience across the slot before lifting a backhander behind Cavallin for his 19th of the season at 11:11, unassisted. Sudbury held the first-period edge in shots 11 – 7, and led 2 – 0 on the scoreboard. The Wolves struck twice just nine seconds apart in the second period. First, Blake McConville fired a hard shot far-pad on Cavallin near the 11-minute mark. Cavallin kicked the rebound back to the right circle where Ruzicka sent it to the bottom of the left circle. Liam Ross one-timed it into the net on the back-door play for his seventh of the season at 5:02. Then, Blake Murray scored his 23rd of the season as a reward for being in the right place at the right time. Nolan Hutcheson dished a hard pass toward the slot from a scrum deep in the right corner. The puck deflected off Murray and into the goal at 5:11. Isaak Phillips picked up the second assist. Flint was able to light the lamp at 7:38 of the middle frame. The Wolves won a neutral-zone face-off, but a pass between the two defenders was intercepted by Jacob Winterton. He made a move in the high slot before snapping a shot just inside the post, blocker-side. The unassisted tally was his 10th of the campaign. Murray responded with his second of the night at 9:20 to reclaim the four-goal lead for Sudbury. Hutcheson and Byfield assisted on the goal. The Pilon twins connected for the home team’s sixth marker. Drake Pilon took the initial shot from the right point and Darian Pilon redirected it in front of Cavallin for his 13th of the season at 17:09. Macauley Carson was given the second assist. Goal seven was scored by Hutcheson on the power play. It was his seventh of the season, scored at 18:13 and assisted by Murray and Liam Ross. Emanuel Vella started between the pipes for period three. Ethan Keppen scored Flint’s second goal on the power-play at 5:37 on a rebound opportunity in front. Cody Morgan took the initial shot from high in the left circle. For Keppen, it was his 23rd of the season and his seventh in the past four games. Keppen has also now recorded points in 15 of his last 16 games. Along with Morgan, Riley McCourt picked up an assist, extending his point streak to seven games. Murray finished the hat trick at 12:12 with a seeing-eye shot through traffic that found the top left corner of the net. Hutcheson picked up the solo assist. Finally, Hutcheson scored his second of the night and 18th of the season at 19:39, assisted by Ryan O’Bonsawin and Byfield. Final shots were 41 – 18 to Sudbury’s advantage. 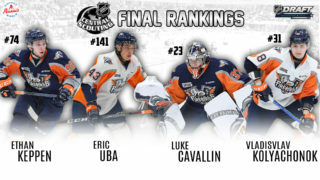 Next up for Flint, the Firebirds will travel to Barrie for a Saturday night contest against the Colts at 7:30 p.m.